The desire for the Beckford Arms to be really dog-friendly is hampered somewhat by the nearby Fonthill Estate, which is home to a sheep farm and a sheep stud. So there’s a limit to how welcome dogs can be (dogs aren’t allowed in the exquisite self-catering lodges across the road), but the Beckford Arms has a decent stab at it. 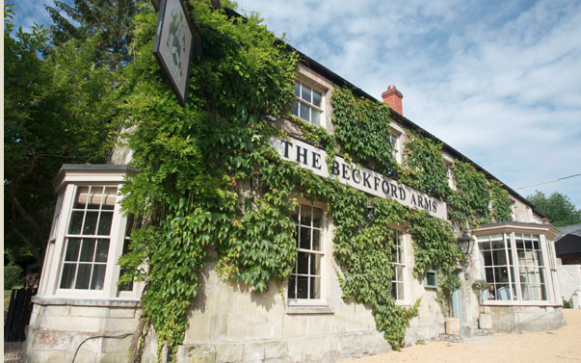 Eat: The kitchen at The Beckford Arms is focused on making the most of local Wiltshire produce, with as much as possible sourced from the onsite kitchen garden and the rest coming from local suppliers. You can eat with your dog in the bar or lounge, but they are not allowed in the main dining room, where things get (just a little) more formal. Sleep: The rooms are more chic than most to be found at a country pub, with the crisp Egyptian cotton sheets and goose down duvets of a swanky hotel. Artfully designed, the interior adds to the relaxing experience. There is only one room that allows dogs (room 6, which has a wooden floor rather than carpet). There is a £15 a night charge for dogs, which includes a dog bowl and a bone or two. There’s also a dog bath outside to allow you to remove the worst excesses of a muddy walk. Walk: There are numerous walks directly from the door of the pub into the surrounding area that covers the Cranborne Chase and West Wiltshire Downs. The owners are happy to point guests in the right direction and recently put together a PDF guide of their favourite local walk. And while much of it will have to walked with the pooch on a lead, the Fonthill Estate boasts some 10,000 acres of Wiltshire countryside to explore.